Let’s be honest, shoulders make or break a great pair of arms. They make you appear wider, adding to that aesthetic look every lifter desires. Some believe that they do not need to be directly hit, since they are a secondary mover in almost every upper body compound movement. Because of that very reason, I believe the complete opposite. A system is only as strong as it’s weakest point, don’t let your shoulders be that point. Give them an isolation workout, and hit them from every angle. Grow your pumpkins; be proud of your pumpkins. Light warm-up sets- 2-3 sets of 10-15 reps with very moderate weight. This will familiarize the movement, and bring blood to the shoulders. Standing 1 arm dumbbell shoulder press: 4×10; 120seconds rest. Set-up: You will only need one dumbbell. Be sure to pick one that is lighter than you would for a traditional seated DB military press. You will also need to find a non-movable piece of equipment to grab for stability. Execution: Feet should be just wider than shoulder width, with knees slightly bent, and core contracted for a rigid torso. Hoist the dumbbell to shoulder height with the help of your other arm. Once in position, grab for support with the non-working arm. While keeping shoulders level, press the dumbbell until just before lockout. The dissent should be very controlled and stopped as your elbow drops just below your shoulder. Tips: Body weight should be centered, with no visible lean in any direction. Technique is very crucial for this lift. I would not recommend throwing up big numbers until proper form is second nature. Front raise/lateral raise hybrid: 3×10; Superset lift 1- no rest. Set-up: Grab 2 dumbbells. Preferable the weight you would use for a DB front raise. Execution: While keeping elbows fairly bent, raise your arms in the direction between a front raise and a lateral raise. If someone were to take a picture of you during the peak of the movement, your arms would resemble a person riding a motorcycle with big handle bars. Exhale as you raise, and inhale as you drop. Tips: Try your best to keep your shoulders depressed (avoid shrugging). Also, slightly loose form is suggested, but don’t get sloppy and excessively swing. Plate or resistance band partial raise: 3×15- Super set lift 2; 120s rest. Set-up: Grab barbell plates, or a resistance band that you could not perform a complete lateral raise with. Plates held in front of body. 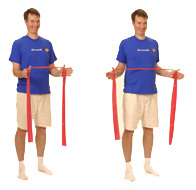 Resistance band should be stepped on and feet width adjusted to desired tension. normal ROM. The weight should be controlled at all times; this may require high mental intensity. Set-up: Grab 2 dumbbells, moderate weight. Slightly lighter than you would for a normal lateral raise. Execution: Everything should resemble a lateral raise, EXCEPT elbows should be rotated out. This should allow you to slightly see your pinkies. Lift the weight so that the contraction is focused onto your posterior shoulder. Elbows SLIGHTLY bent. Do not shrug shoulders! Exhale on raise, and inhale on dissent. Tips: As mentioned above, DO NOT SHRUG, that is crucial. Shrugging will deter the work away from your posterior delts where it is desired, and redirect it to your traps where it is unwanted. This lift is the perfect way to slightly target your posterior shoulders so that you may keep them in your “push day”. 4 direction burn-out: 2×28 reps; 30s rest. Set-up: Grab a very light set of dumbbells. Think about it, you’re going to perform 28 reps.. Execution: Below is the sequence. Tips: Perform all reps slower than usual. Chase the burn, chase the pump. Completely fatigue your shoulders. Keep form F-L-A-W-L-E-S-S.
An entire push day (chest, shoulders, triceps), or biceps. You may also pair individually with any of the push muscle groups. I would not advise doing them the day before chest. For more workouts click below.